With Radford having an 11-game winning streak and Graham having a 13-game winning streak, it appeared this match up would be a barn burner. That was not the case, as the G-Men (13-1) throttled the Bobcats (12-2) 57-13 in the state semifinals. 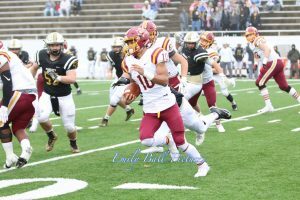 Graham forced five first-half turnovers and quarterback Cameron Allen accounted for six first-half scores to jump out to 48-0 halftime lead. 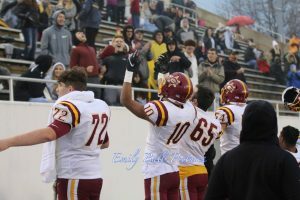 There was commotion on social media about the VHSL forcing games to be moved to alternate locations due to nasty weather and field conditions. Radford, who earned the right to host a semifinal game with the top seed in Region 2C, had to move the game to Salem Stadium. While Salem is closer to Radford than Bluefield, Graham benefited from the move since it was to a turf field. The G-Men share a turf field with Bluefield (WV) High School and Bluefield College, so they are well adapted. Radford played at Salem earlier in the regular season against Giles when the Bobcats faced electrical issues at their stadium. They also played on the new turf field at Christiansburg High School when they hosted Gretna in the regional semifinals. Graham received the opening kickoff and went to work driving down the field picking up chunks of yards from Tre Booker and Cam Allen. Radford held Graham to a fourth-and-one near midfield but fullback Jaziere Reed trucked a defender to give them a fresh set of downs. The G-Men capped off the six minute drive with a quarterback keeper from 12 yards out. 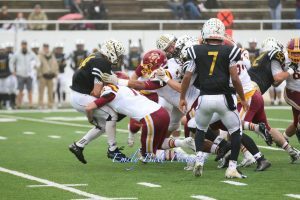 The Bobcats offense showed signs of life on their first possession picking up first downs from quarterback Zane Rupe. The drive came to an end when running back P.J Prioleau caught a screen pass and fumbled as soon as he crossed into G-Men territory. Graham capitalized on the turnover when Allen connected with Reed on a short dump off pass that ended up going 53 yards to pay dirt. G-Men lead 14-0 at the end of the first. The second quarter was all Graham as they scored 34 points to put the game out of reach. The turnover woe continued for Radford as Prioleau fumbled again and Rupe threw three interceptions. The G-Men capitalized on every turnover. Allen scored on his legs again from 12 yards out and had touchdown passes of 54, 33 and 12 yards to three different receivers. There was no stopping the 6-foot-2,185-pound superstar. Peyton Kiser closed out the half with an 29-yard interception return for a touchdown to put the G-Men up 48-0. Radford finally got on the board in the fourth quarter. Prioleau scored twice from 45 and 10 yards out. Graham added nine more points to their total with a 32-yard field goal from Dales and a 15-yard touchdown run from Wimmer. Graham racked up 339 yards of total offense and held Radford to just 140 yards. Allen was 9-of-13 passing for 171 yards. He rushed for 82 yards on eight carries. Prioleau had seven carries for 73 yards and Rupe carried the ball four times for 46 yards. The Cinderella story was cut short for the young Bobcats. 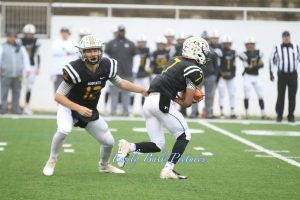 While they suffered their worse loss of the season, 12 wins with a district and region title is something to be proud of after finishing 2017 at 2-8. 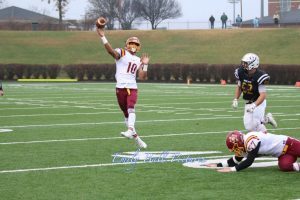 Graham returns to Salem Stadium on Saturday for the Class 2A State Championship against the Goochland Bulldogs. The G-Men look to claim their third state title, as they contend for the first time since 2001.